Benjamin Breckinridge Warfield (18511921) was undoubtedly one of the greatest Reformed theologians in the history of America. As professor of didactic and polemic theology at Princeton University, he wrote extensively in defense of fundamental Christian doctrines. While his writing touched on the full spectrum of theological topics, it was spread over hundreds of periodicals, books, and pamphlets, and a significant portion has never been published in an accessible form. Warfield stands as a dominant figure on the theological landscape, but few have a comprehensive grasp of his theology, largely because of the difficulty of tracing his ideas through numerous sources. About "The Theology of B. 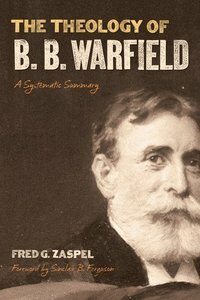 B. Warfield"
The first comprehensive, systematic treatment of B. B. Warfield's theology. This single volume gives scholars, pastors, and students a concise account of Warfield's position on all theological topics. Fred G Zaspel (Ph.D., The Free University of Amsterdam) was for many years pastor of Word of Life Baptist Church here in Pottsville and adjunct professor of New Testament at Penn State University (Schuylkill Campus). He is now a part of the pastoral ministry of Reformed Baptist Church of Franconia, PA, and instructor in Bible and theology at To Every Tribe Ministries in Brownsville, TX. His dissertation will focus on the theology of Benjamin Breckinridge Warfield, soon to be published by Crossway. He is the author of a series of booklets published by the Interdisciplinary Biblical Research Institute (IBRI), entitled, The Continuing Relevance of Divine Law (1991); The Theology of Fulfillment (1994); Jews, Gentiles, %26 the Goal of Redemptive History (1996). Along with Tom Wells, he has co-authored a major work entitled New Covenant Theology. Fred G. Zaspel (Ph.D., Free University of Amsterdam) was for many years pastor of Word of Life Baptist Church in Pottsville and adjunct professor of New Testament at Penn State University (Schuylkill Campus). He is now a part of the pastoral ministry of Reformed Baptist Church of Franconia, PA, and instructor in Bible and theology at To Every Tribe Ministries in Brownsville, TX. His dissertation will focus on the theology of Benjamin Breckinridge Warfield, soon to be published by Crossway. He is the author of a series of booklets published by the Interdisciplinary Biblical Research Institute (IBRI), entitled, The Continuing Relevance of Divine Law (1991); The Theology of Fulfillment (1994); Jews, Gentiles, & the Goal of Redemptive History (1996). Along with Tom Wells, he has co-authored a major work entitled New Covenant Theology.